The shortest month of the year feels like it’s been the longest as winter drags on with no end in sight. March will pick up right where February left off with single digit temps through the weekend and into the first part of next week but then it looks like something might just be starting to happen. Things could change between now and then but at this point it looks like we’ll be bathed in sunshine Sunday through Tuesday and while the temps will be far from warm we all know how good that late winter sun feels. We’ll climb into the 20’s on Wednesday and Thursday and near 30 on Friday. Is it a warming trend? Here’s hoping so! We’re thankful to have made up for winter’s slow start with plenty of precipitation throughout the last month but I for one have had just about enough. I’ve had enough of shoveling snow. I’ve had enough of fighting ice dams on the roof. I’ve had enough of NOT FISHING! 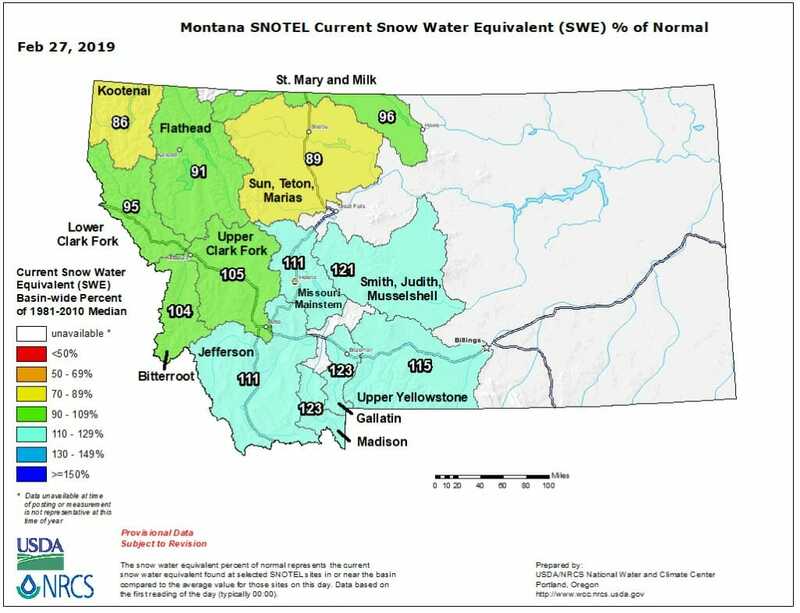 Snowpack has edged up to 110 – 120 percent of normal in our region and most of the state looks good right now at or near 100 percent of average. Only the Kootenai and the Sun, Teton and Marias drainages are lagging behind but are currently right around 90 percent of average. We like the looks of this map and we’re remaining cautiously optimistic that high water will not be an issue however Mother Nature always gets the final say on this so no guarantees here. Ideally we’d see a return to normal temperatures sooner rather than later. The average high for February is 39 degrees, we’ve seen highs in the single digits or below zero more days than not this month. The average high for March is 47. 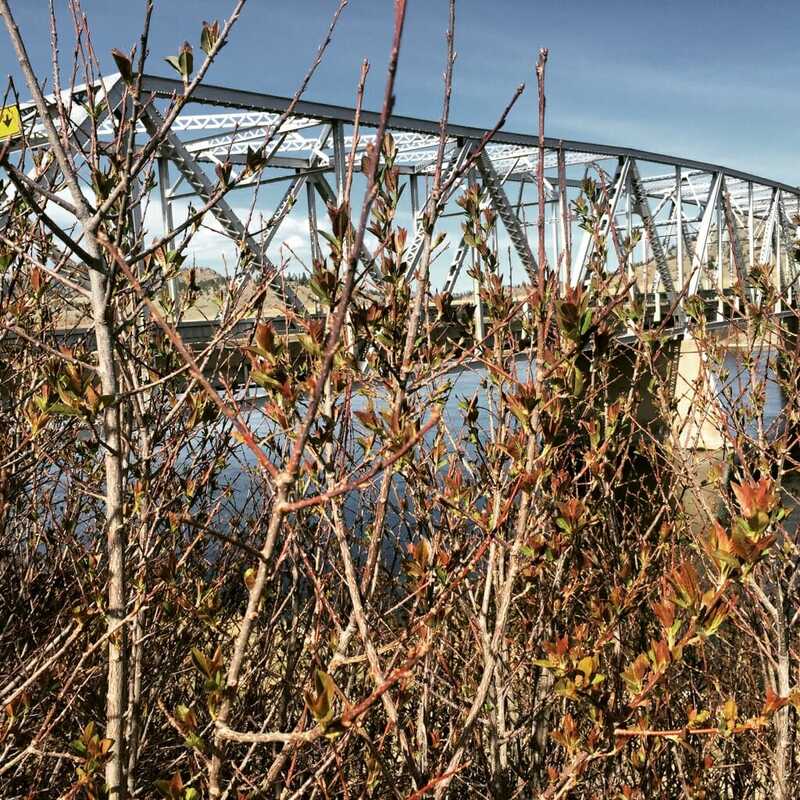 We obviously won’t see that the first week of the month but sooner or later it has to warm up and when it does we’re expecting an extremely busy spring as the throngs arrive to satisfy that long-delayed Missouri River Fix. 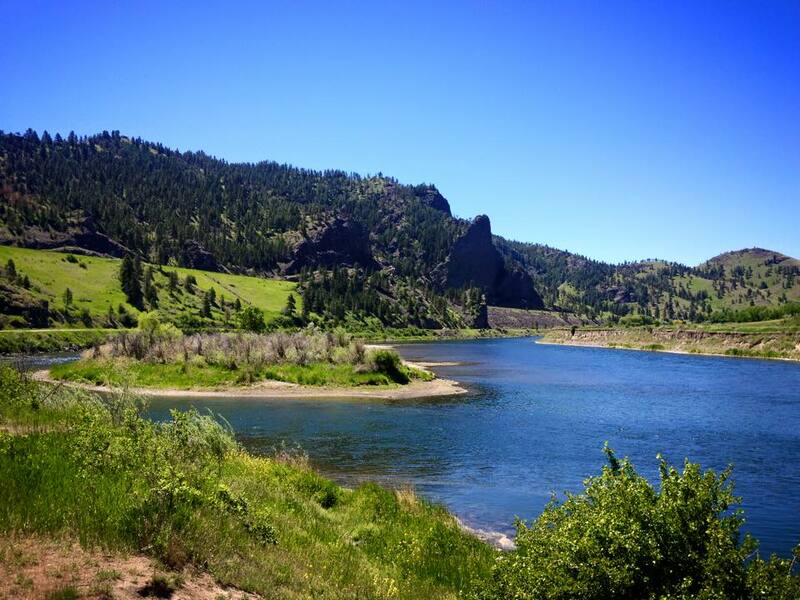 And speaking of spring fishing, don’t forget it’s time to buy your 2019 Montana fishing license. 2018 licenses expire tomorrow. Sadly we still have no fishing report to share but as you look towards the eventuality of spring fishing here’s what you need to know. Water temps are currently holding in the 33 degree range….COLD! We would expect much of March to be full on winter fishing as far as the nymphing goes. Slow, deep water is what you’ll want to target with winter fare. Pink should be in the mix along with firebeads, tailwater sows, Yum Yums, Caviar Scuds, Zebra Midges, Rainbow Czechs, Soft Hackle Sows, Lightning Bugs, Ray Charles etc. Fish deep with weight (tungsten bead nymphs or split shot or both) and cover the water from the inside out, shortening the depth of your rig until you find where they’re at. 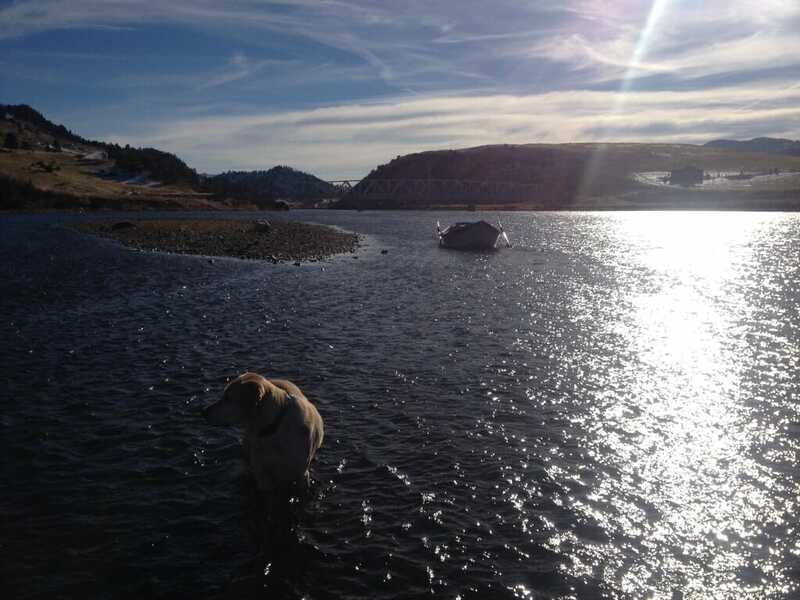 Warming water will get them moving at which time we’ll start to key in on the traditional spring hot spots, typically a little faster current with a little less depth. We like to run sowbugs all season long as they’re a constant food source but as we move into spring we will typically swap out the winter fare for mayfly nymphs and maybe even a dirt snake. Little Green Machines and the like tend to shine as the water conditions hit the spring prime. Spring is brown trout time as the spawning rainbows become scarce. Watch those redds and please don’t target spawning fish. Late March through April and into the first part of May are the prime weeks for streamer fishing on the Missouri. We can’t wait! Spring is also dry fly time as the Midge Machine churns out piles of bugs. We typically start fishing midges in late February but since nobody has been on the river harassing and educating the fish this year, those first few fishable days could be lights out with relatively easy pickings. Don’t care for fishing midges? Spring is also Skwalla time so if throwing big dries is your thing don’t miss this opportunity. Many of the larger browns we catch each spring fall for the Skwalla. I think we could be in for one phenomenal spring if this weather ever breaks and while it’s tough to shift gears to fishing mode while winter continues to have a stranglehold, it’s coming soon so there’s no time like the present to prepare. It’s time to dig out your gear and get it organized. It’s a great time to replace those old, worn fly lines and this is the spring you should treat yourself to a new pair of Simms waders and boots. We’d be happy to help you with that! 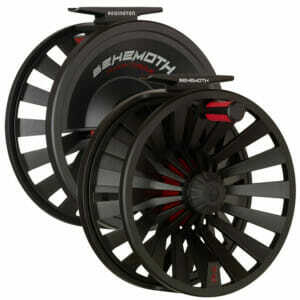 How about a brand new Lamson, Ross or Redington reel or maybe a new LOOP, Redington or Echo rod. We’ve also got a limited supply of Nautilus reels we’re clearing out at 25% off. Once they’re gone they’re gone. Great deals on Simms winter wear including Cold Weather Pants and Shirts and guide flannels….all 25 % off. Help us make space for the new gear arriving daily. Remember spring is also time for the WCA Spring lodging and guide trip special….we guarantee it’s the best deal you’ll find on the MO’ and it’s happening right now! $500 for two nights of premium lodging at Wolf Creek Angler and a full day guide trip for one or two anglers through the end of April. This same package will cost you over $800 starting May 1st so don’t miss this opportunity. Following a week of subzero temps the forecast is calling for a bit of a respite these next few days with highs supposedly approaching the mid 30’s today before dropping back into the 20’s for the remainder of the week. Back to single digits on Sunday and then we’re hoping for that warm up which will get us back on the water. There’s snow in the forecast for tomorrow and a chance of scattered showers and flurries throughout the week. 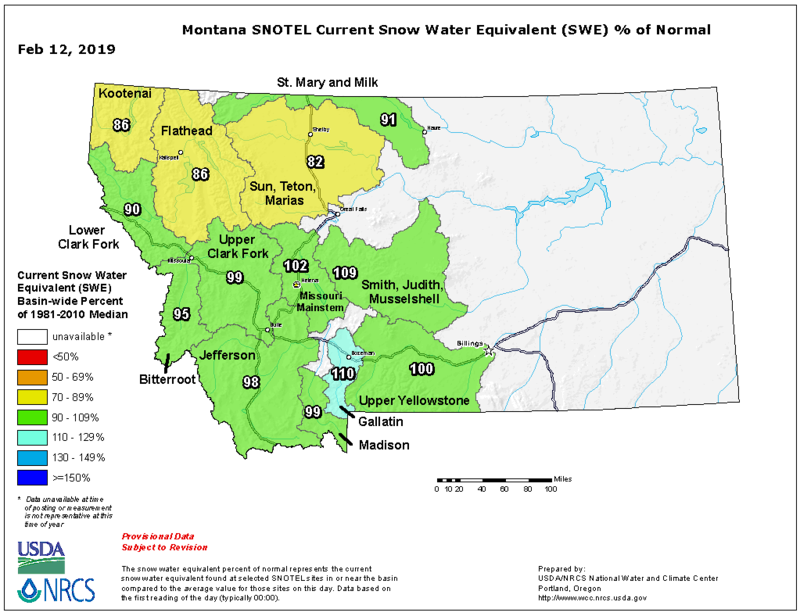 The snowpack is moving towards average in most drainages so although it’s still very early to say with any degree of certainty what the water situation will be this spring we’re liking what we’re seeing at this point. 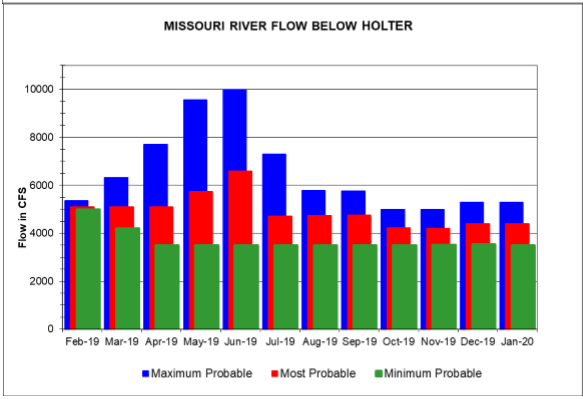 Current “most probable” flow predictions have us holding in this 5,000 CFS range for the next couple of months with a bump to around 6,000 in May and a peak of <7,000 in June and then back to around 5,000 for the summer season. If it plays out this way you really couldn’t ask for better conditions for summer fishing. We wouldn’t mind seeing a bit more of a flushing flow at the peak but following last year’s 18-20K which kept the walk/wade crowd from coming and all but eliminated spring dry fly fishing, we’re good with the busy spring that these flows would bring. Max Probable predictions have us creeping up towards a peak of 10K before dropping into the 6-7,000 range for the summer while the Minimum probable has us dropping into the 3500 CFS range by April and holding there for the season. Fingers crossed that this won’t be the case. If you’re brave enough to venture out this week wading is likely your best bet as the ramps and the parking lots have not been plowed. If you’re wading there’s a fair amount of shelf ice out there, mostly in and around that slow water you’re going to want to be fishing so please use caution and also keep an eye out for those floating chunks of ice. We’re starting to do a brisk lodging business with the hard water crowd now that Holter is fishing well so if you do see a weather window coming and you think you’d like to come out and fish with us try to call well ahead of time as the weekend lodging tends to fill up by the middle part of the week. The shop is open from 8:00 AM – 4:00 PM Wednesday – Saturday and 10:00 AM – 2:00 PM on Sundays, weather permitting. We’re open EVERY DAY for lodging and guide trips and speaking of lodging and guide trips…don’t miss our winter guide trip and lodging special. That’s two nights of premium lodging and a full day guide trip for one or two anglers for just $500. You won’t find a better deal anywhere. 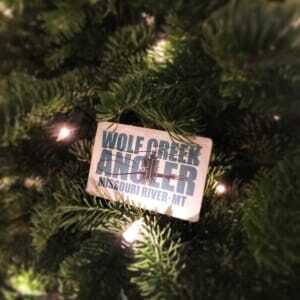 It’s been a lonely February so far at Wolf Creek Angler. Here’s hoping for warmer weather and mild winter days on the water. We hope you make us your first stop on the way to the MO for lines, leaders, tippet and shuttles. 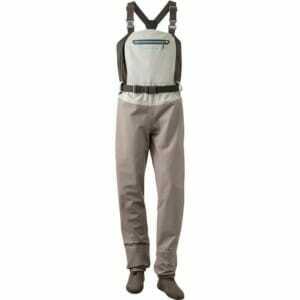 Simms waders, boots and cold weather gear. 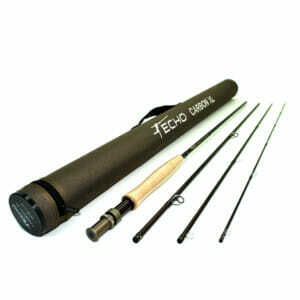 Loop, Echo and Redington rods. Ross, Nautilus, Lamson, Echo and Redington reels and of course the largest selection of Missouri River flies ever assembled under one roof in Wolf Creek Montana. Our picks for the best fly fishing gifts of 2018. Longtime staples around here for cold weather fishing and all around winter wear. Pants equipped for deep-freeze conditions. Subzero mornings? No sweat. Simms’ Coldweather Pants combat the conditions thanks to micro fleece-lined internals and hand-warmer pockets. Angler-appreciated extras include COR3™ fabric technology; an adjustable waist with a corrosion-fighting center-front snap; and articulated knees for bolstered durability and massive mobility. Our best selling reel in its class! Weight: 3.2 LBS per pair with felt soles. The all new Sonic-Pro wader uses 4-layer waterproof-breathable fabric and SonicWeld seams to create a simple wader with superior durability for uncompromising performance on the water. We designed this wader with minimal pockets and a clean silhouette to provide anglers a durable wader that simply performs in all conditions, from deep steelhead wading to hot summer trout runs. The all-new WOMEN’S SONIC-PRO wader was designed specifically for female anglers. This wader incorporates our reliable, extensively field tested 4-layer waterproof-breathable fabric and SonicWeld seams to create an ultra-functional wader with superior durability for uncompromising performance on the water. 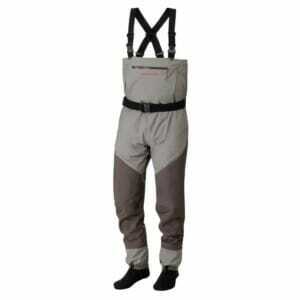 Stretch side panels allow anglers to move easily in and out of this wader and add comfort on the water. The flattering design works to fit a woman’s body properly, with minimal pockets to reduce bulk and a stretch mesh back panel to move with the body while casting and crouching. The WOMEN’S SONIC-PRO wader simply performs; it’s durable, comfortable, and designed for women who fish. Our best-selling fly rods…three years running. 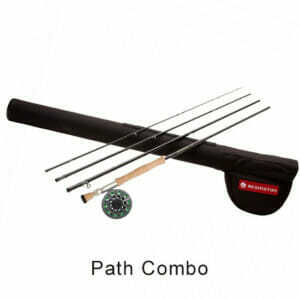 A true all-around performer with the features and feel associated with rods four times the cost. Tim Rajeff designed these rods to be airy-light with actions that benefit a wide range of casting styles and fishing situations. Bass to browns, bluegill to brookies, the Carbon XL covers it all. 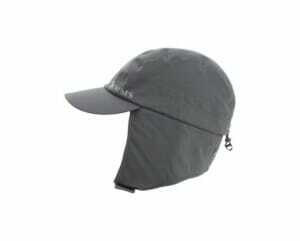 Mandatory headwear for winter fishing on the MO’. Fleece furnace meets 3-layer GORE-TEX® Pro Shell protection Snuff an Arctic assault with Simms’ fully waterproof, quilted fleece-lined 3-layer GORE-TEX® ExStream™ Hat. Features include a plush elastic sweatband and customizable fit thanks to an adjustable circumference with a back cord lock. Black under the brim reduces glare. One size fits most. What’s that call echoing throughout the land, bouncing off mountains and tumbling through valleys? “Cold beer, and lots of it!” the armies of the thirsty cry out. Rising to the call for cold, fresh beer, the 64oz Classic Vacuum Growler lets you transport your favorite brew in fully functional and iconic style. Take control with a rugged handle for easy carry and one-handed pouring. The wide mouth allows for quick filling, sharing, and cleaning. That satisfying ‘pop’ you hear when you open this bad boy is a sure sign your beer is fresh and bubbly. It ain’t Grandad’s old vacuum bottle, but he’ll raise his pint in admiration. You might just have to top him off. Fly boxes make great Christmas gifts and we’ve got something in every price range. From $24 plastic WCA logo boxes to hand-made Al Swanson boxes and everything in between. Choose your box and load it up. Don’t forget our “Cheaper by the Dozen” special going on now…$5/dozen flies while they last. 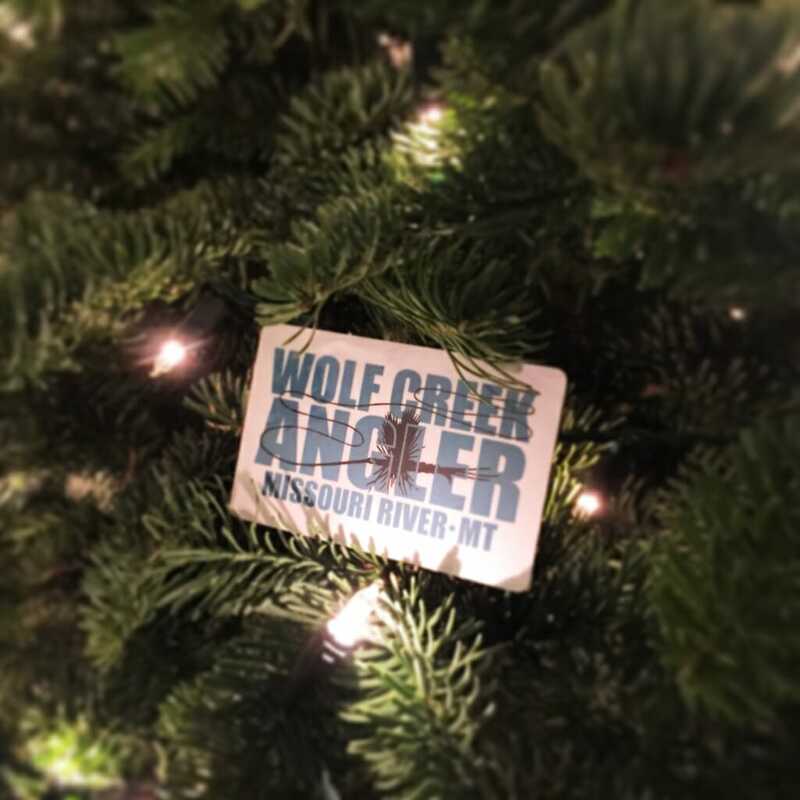 A perennial favorite for any occasion, but especially for the holidays…WCA gift cards are the perfect gift for all of those anglers on your list for whom you have absolutely no idea what to buy. You can get them in any amount, they never expire and they’re good for absolutely EVERYTHING we sell. Lodging, guide trips, shuttles, boat rentals, merchandise….EVERYTHING! We’re happy to mail them anywhere in the world you need them sent. Just give us a call and we can take care of all of it right over the phone. These are just a few ideas based on some of our more popular items but we’ve got a shop full of all kinds of gear in every price range. We’re more than happy to help you with gift ideas and while we haven’t yet ventured into E-commerce we’re more than happy to ship you whatever you need. 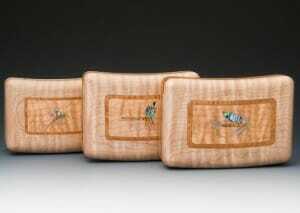 We hope you keep us in mind when shopping for your favorite fly fishers. I overheard some folks at dinner the other night proclaiming that the season is back after apparently having had a particularly good dry fly day, and while I’m not sure it ever really started to begin with it does seem as though things are coming into shape….just in time for the late summer lull. There are bugs (tricos a plenty, lingering PMD’s and caddis in the evening). The water is perfect for wading (right around 5K and holding) and most importantly, there are pods of rising fish. It’s happening much later than what it usually does but better late than never! As luck would have it the summer traffic cycle has been normal. Prime Time traffic is over but Prime Dry Fly Fishing has just begun. 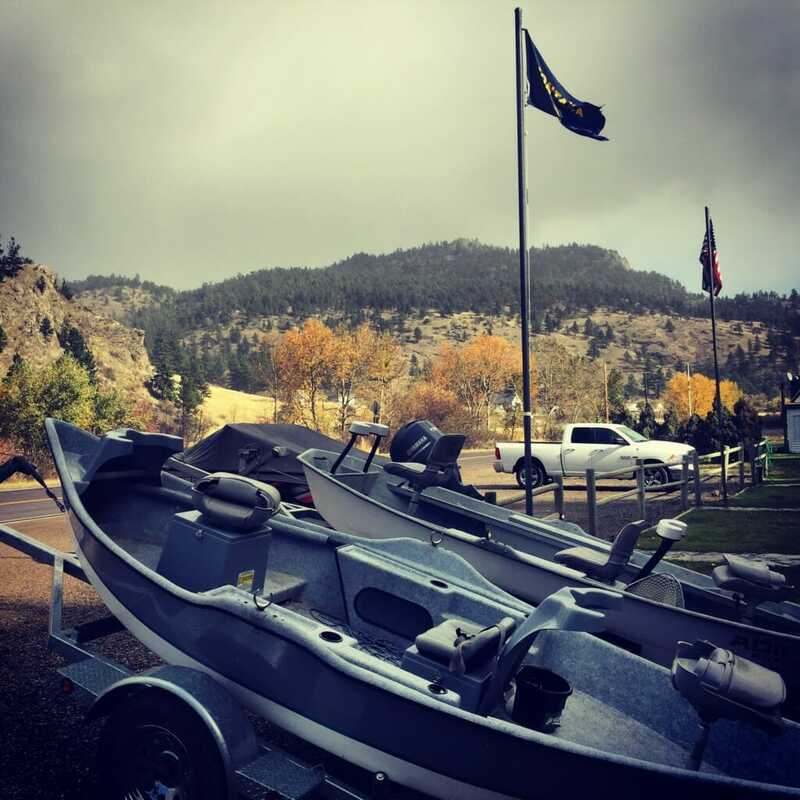 The boat ramps are quiet (relatively speaking), there’s an abundance of lodging and guide availability and the river is calling. 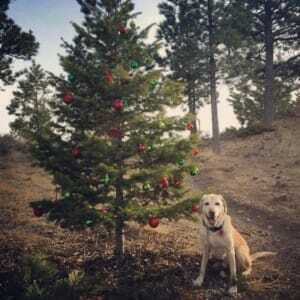 As if that weren’t enough, starting tomorrow we’re running our Dog Days of Summer Lodging and Guide Trip special. For the entire month of August when you book a full day guide trip and a night of premium lodging we’ll throw in a second night of lodging for FREE. Keep in mind prime time usually books out a year in advance. Now you’ve got a golden opportunity to fish prime conditions on the Missouri at a huge cost savings with a last minute call. We can’t make any promises about the fishing. It’s been good these past several days and hopefully will continue to be but there are no guarantees. The conventional wisdom is that tricos will continue through the month of August. PMD’s are all but done but terrestrials are about to become a major player. Caddis activity has been somewhat sporadic but is always a possibility. Will we see epic dry fly days throughout the month of August? Time will tell. I expect we will see some good days and some not so good days, as always. Give us a call today to book your Dog Days Special. You’ll have the potential for some awesome Trico fishing and there is no better month to fish hoppers on the Missouri. Some of our biggest browns of the season are always caught on hoppers. I haven’t even mentioned the nymphing since most of the focus seems to be on top right now but should you want to fish the bobber you’ll likely do just fine. Best Dries- Indicator Spinner Trico, Hi Vis Trico Spinner, RS2 Trico, Drowned Trico, Barr’s Trico Emerger, Trinas Hi Vis Sprout Black, Bloom’s Parachute Caddis, Outrigger Caddis, CDC Caddis Emerger, X Caddis, Front End Loader and your grass hopper or ant of choice. We like More or Less, Moorish and White Cloud hoppers just to name a few. It’s also time to take advantage of the best deals of the season on Simms sportswear during our Annual Summer Sale. 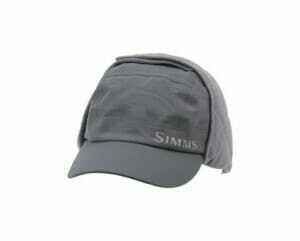 25% – 30% off men’s and women’s sportswear from Simms, Ouray and more. This could be the best August we’ve seen in years. Will you be here for it? It’s hard to believe but March has all but passed us by and while we traditionally expect March to come in fiercely like a lion and go out gently like a lamb it looks like the winter lion is going to stick around for a while yet. Rain and snow are likely tomorrow with gusty south southwest winds in the afternoon ushering in a cold front which will drop us into the teens tomorrow night. We’ll see a high of only 32 on Saturday with a chance for some snow but Sunday looks better with temps back near 50. Maybe not the ideal weekend to fish the Missouri but sooner or later we’ll get there. We definitely saw an increase in traffic this week with spring breakers taking advantage of some decent weather and enjoying the sunshine on the windy MO’. Fishing reports have been inconsistent but overall I’d say it’s been fair for most. As you would expect those who fish here often are having pretty good luck out there while those who are here for the first time or only hit it once or twice a year have been having a tougher go of it. Nymphing is your best bet for numbers and not much has changed on the bug front. Anything with a pink bead works more often than not and firebeads are getting it done as well. 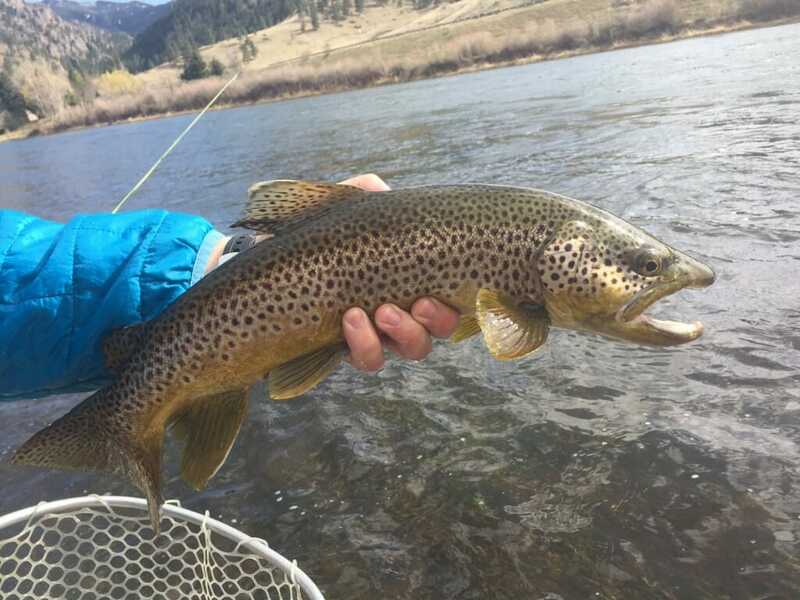 The hottest bug of the spring thus far has been Pederson’s Sow (available exclusively at Wolf Creek Angler and currently in short supply but more are on the way). Pill poppers, Lucent Bead Rays, UV Crush, Bubble Yums, Pink Radiation Baetis and Wayno’s Cotton Candy have all been catching plenty of fish. Don’t shy away from black Zebras, tailwater sows, firebead rays etc. I’m still sticking with a #12 Pink Amex for a lead fly more often than not but Tungsten Rainbow Czechs, Casne’s Pinkalicious, Pink Weight Flies and Bubble Yums work too. Some have gone to the worm and done well. Fish are still holding in the slower, deeper runs but we are starting to see a migration to transitional water so fish the slow stuff but don’t be afraid to hit that medium fast, medium depth water as well. Some are fishing deep rigs and doing fine, we’ve been sticking with a 7′ – 8′ overall depth, sometimes with no weight, sometimes with a bb. Streamer fishing has been hit or miss but if you stick with it throughout the day you should encounter at least a hot stretch or two. Kreelex, Craven’s Dirty Hippy, Sparkle Minnows, Lynch’s Drunk and Disorderly, Baby Gongas, Polar Leeches, Montana Minnows, Clousers and ZK’s Son of Bunny in pearl and MK Ultra in grey (both available exclusively at WCA) have all been effective. Greys, whites and olives have been good but as I say often fish what you like and what you have confidence in…it makes all the difference in the world. 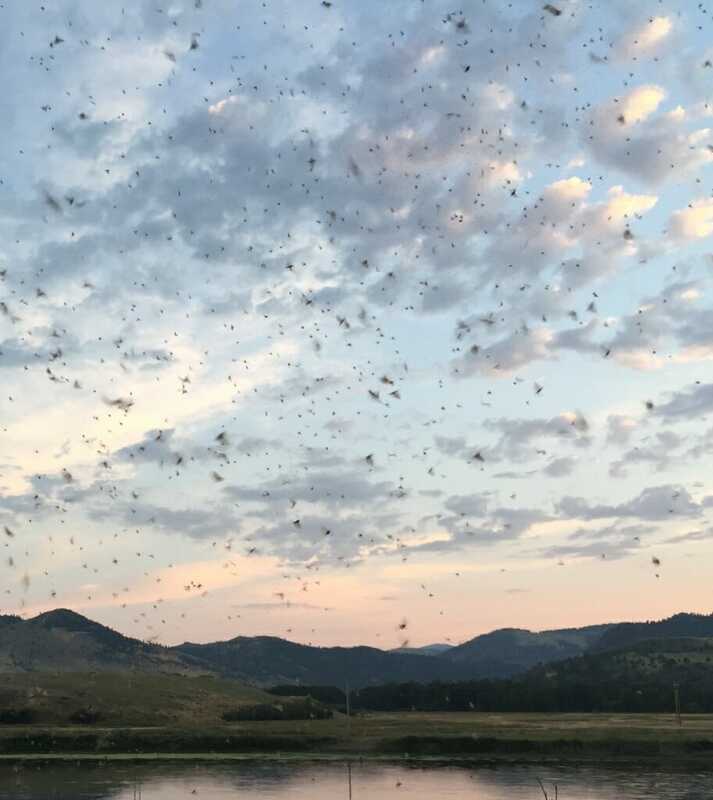 Midges a plenty daily. Some days the fish are on them, some days they aren’t. Keep that dry fly rig at the ready. I’ve been running a hi-vis para adams with a Bucky’s Midge Cluster and haven’t seen any reason to switch it up but any Griffiths gnat or midge cluster ought to do the trick. Overcast days have definitely been better overall (especially for streamer fishing) but we’re catching plenty of fish in the sun as well. Fish when you can. Our spring lodging and guide trip special has been gaining in popularity as folks come to realize what an absolute STEAL of a Deal it is. Once again, that’s two nights of premium lodging and a full day guide trip for one or two anglers for just $550. We challenge you to find a better deal on the MO’. We’re at about 50% open on our lodging just waiting for temps to stabilize before we open the rest but hopefully it won’t be long. Cabins and bungalows available now, motel rooms open soon. The shop is rapidly filling up with new gear from Simms, Redington, Echo, Ross and more and we’re thrilled to announce that we are now your Exclusive Missouri River dealer for Damsel Fly Fishing, an AWESOME line of women’s fly fishing gear and apparel made right here in Montana. Check them out at www.damselflyfishing.com. We’re also excited to announce that we are now featuring Douglas Fly Rods. 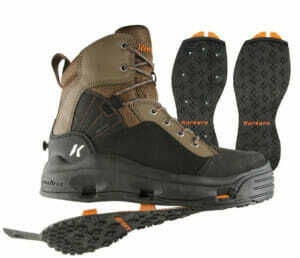 More on this soon but in the meantime check them out at douglasoutdoors.com We’ll let you know as soon as we have them in. We’re sure you’re going to love these rods and we’re hearing nothing but good things from the other dealers around the region. It may not feel like it and it may not look like it just yet but spring is definitely here and we can’t wait to see you back on the Missouri. 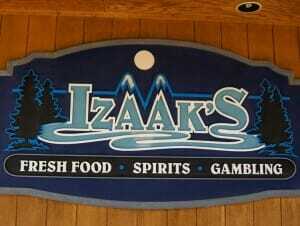 Remember Izaak’s opens Thursday, April 5th and we can’t wait!! If you haven’t finished your Christmas shopping you need to get after it. Christmas is a week from Monday so stop procrastinating and get it done. We ran this a couple of weeks ago but just in case you need some last minute ideas for the fly fishers on your list here it is again. To assist you we’ve put together a list of some of our favorite gift ideas. If you don’t see something here that fits the bill we would LOVE to help you find that perfect gift for the anglers on your list. And don’t forget we’ve got WCA Gift Cards in any amount which can be used on anything we sell from lodging to guide trips to shuttles to merchandise. Just because the leaves are falling and the days are shorter, it doesn’t mean the fish aren’t biting. 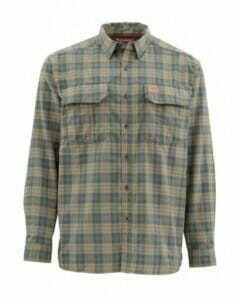 Set out into the chill of the river in warm, plush comfort with the Simms’ men’s ColdWeather LS Shirt. The quick-drying shirt is made with a soft fleece lining ideal for winter fishing. 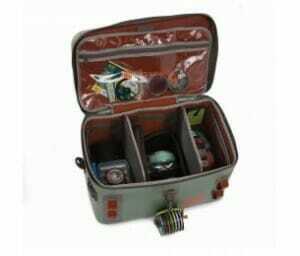 Two oversized chest pockets offer plenty of storage for your fly boxes. 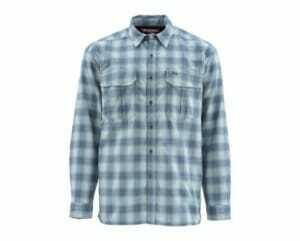 The stylish flannel shirt is finished with UPF 50 sun protection. This is my absolute favorite shirt from September through March. You won’t find a more comfortable, cozy shirt for those cold fall and winter days. Everybody should have at least one! 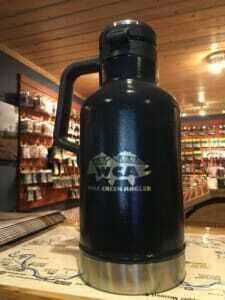 After extensive field testing by the WCA staff we have concluded that this is the best value in growlers you’ll find. 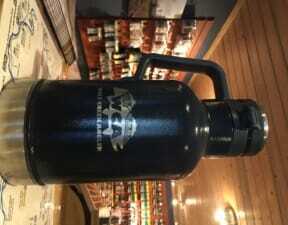 A 64 oz vacuum growler for under $60 and your first fill free at Blackfoot River Brewing Company in Helena…you’d be hard pressed to find a better deal anywhere. With a large arbor for quick retrieves and a hybrid machined/cast design, the Ion is a great choice for balancing single-hand and two-hand rods of all sizes. 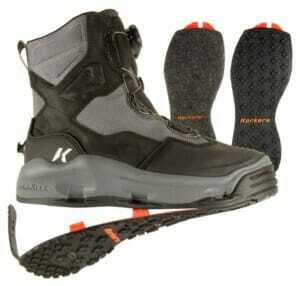 Designed primarily for freshwater use, they can be used in the salt with a little additional care. 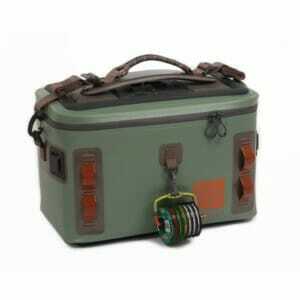 Six sizes make sure that there is an Ion reel to suit your fishing situation. 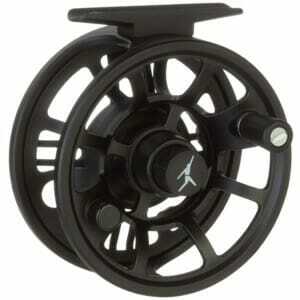 Our best selling reel, the Ion is an incredible value at under $80. 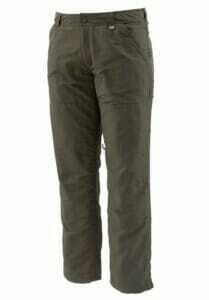 Enjoy winter weather without the sting in Simms’ Men’s Coldweather Pants. The DurapelPlus® durable water-resistant finish on 100% nylon coupled with COR3™ technology blocks water penetration and harmful sun rays with a UPF rating of 50, all while controlling odors. 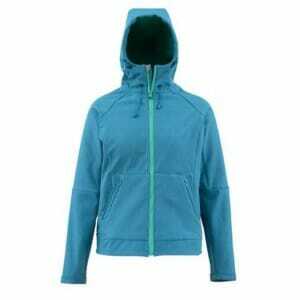 A textured 100% polyester microfleece lining retains valuable body heat. Slash handwarmer pockets with self-fabric abrasion panels protect hands from the bitter cold. Adjustable waist with plastic center-front snap fits comfortably for long wear. 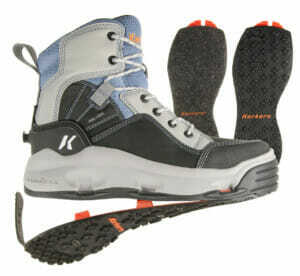 Double-layered, articulated knees for durability and ease of movement. Traditional fit. The perfect companion to the Cold Weather Shirt, you’ll find me wearing these pants all winter long! The new PATH rod is a smooth-casting, medium-fast action graphite fly rod, offering classic performance for all levels of anglers. Rods through 6 weight have a half-wells handle with a wood reel seat for a classic look and feel, and 7 weights and above feature a full-wells grip with anodized aluminum reel seat that is ready for salt or fresh water conditions. Ready to Fish for under $200! Your right-hand, with cold-killing power under the hood For microclimates of the brisk and blustery variety, Simms’ Rogue Fleece Hoody comes equipped with weather-shielding attributes to soldier through the day, including a 100-percent polyester woven face backed with a water-shedding DWR finish. Thaw immobile hands inside fleece-backed handwarmer pockets, and duck sideways weather under the three-panel ergonomic hood. Rogues block UV rays with industry leading UPF 50 protection and include fly box compatible chest pockets, comfort-enhanced rib knit cuffs and hems, and a hardworking YKK Vislon® center front zipper. The Simms Women’s Rogue Fleece Hoodie is designed for all-day comfort on and off the water. This hoodie is constructed of a polyester and nylon fabric blend to provide warmth and ease-of movement. 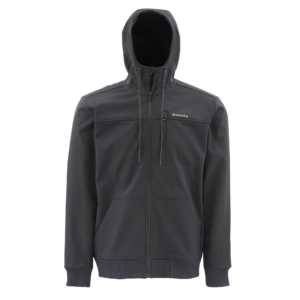 Other features include a water-repellent DWR finish, UPF 50 protection, and a full, center-zip, adjustable hood. 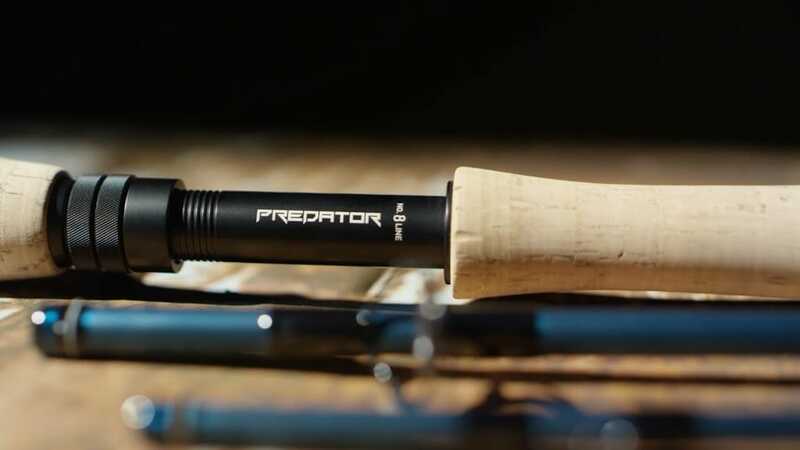 The all-new PREDATOR is the ultimate fly rod for big flies, heavy lines, and aggressive-fighting fish. It features a powerful, intuitive fast action that commands enough power to combat big gamefish and pick up and cast today’s heavy lines and massive flies. Its action is designed to perform in both freshwater and saltwater scenarios, and all components are saltwater-ready. The PREDATOR family encompasses models ranging from spooky-bonefish duty 5-weights to tarpon-ready 12 weights, including unique specialty models like a 7’10” 8-weight and dedicated PIKE and MUSKY models with extended fighting butts for boatside figure-eights. Your new go-to streamer stick! RIO has teamed up with Fishpond to offer the perfect bundle to attach to your vest or bag. 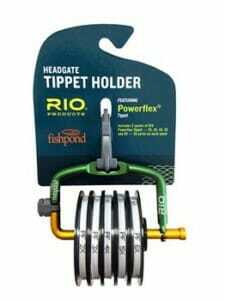 5, 30-yard spools of RIO’s Powerflex tippet material (2X to 6X) are included with Fishpond’s Headgate tippet dispenser in a ready-to-hit-the-water configuration. The Headgate has a spring loaded hinge design that allows anglers to easily add or change tippet spools, and features a built in cutting blade for ultimate convenience. Powerflex tippet has a high knot and tensile strength, and is made of a clear, nylon copolymer. It is ideal for dry flies, soft hackles and nymphs. So often, it’s the marginal moments at the end of the day that deliver the magic. 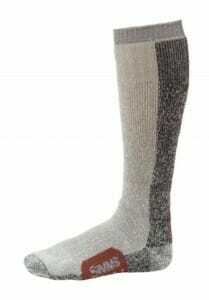 That’s why we made our Guide Thermal OTC Sock. Priority number one is to keep your feet warm, so you can make it to the end of the day and experience the magical moments. 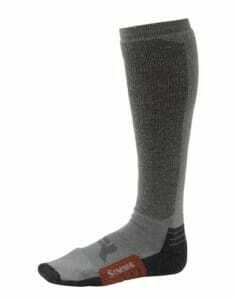 Pure Merino wool is naturally sweat-wicking and provides insulation so your feet stay warm and dry all day. 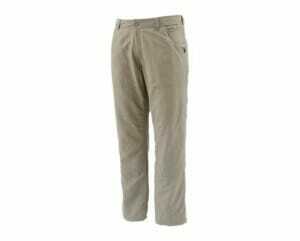 They have just enough stretch to stay in place and are naturally odor-resistant for a long lifespan.